Few posts ago, I blogged on how you can change your manually installed SCOM agents to actually appear as console-deployed. Although this solution is essentially a one time work-around, the solution below is intended for on-going manual installs. 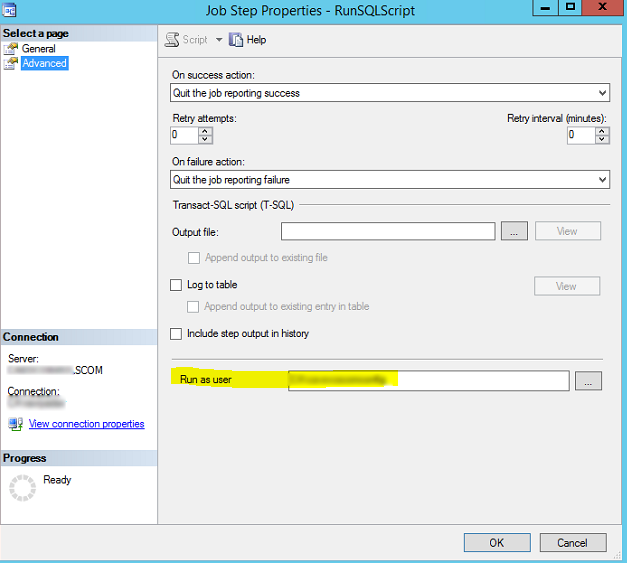 The solution below using the same SQL query and creating an automated SQL tasks that runs on a user-defined interval. Following the steps below, you can set this to run every month (or week, or quarter, etc.) 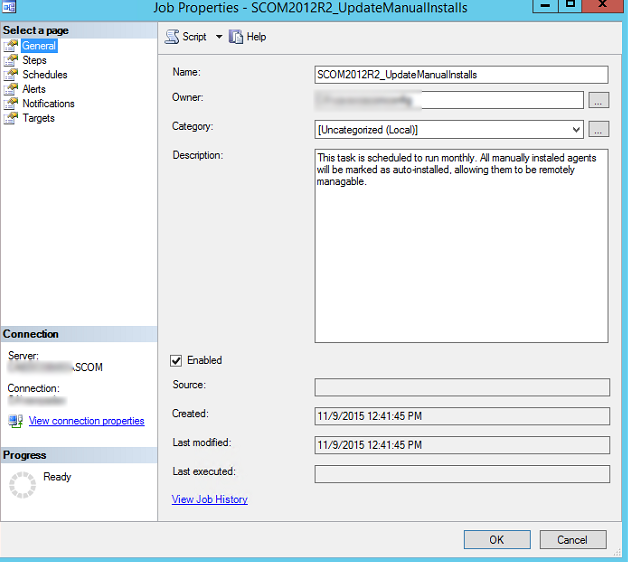 and any manually installed will back their “Change Primary Management Server” enabled again. 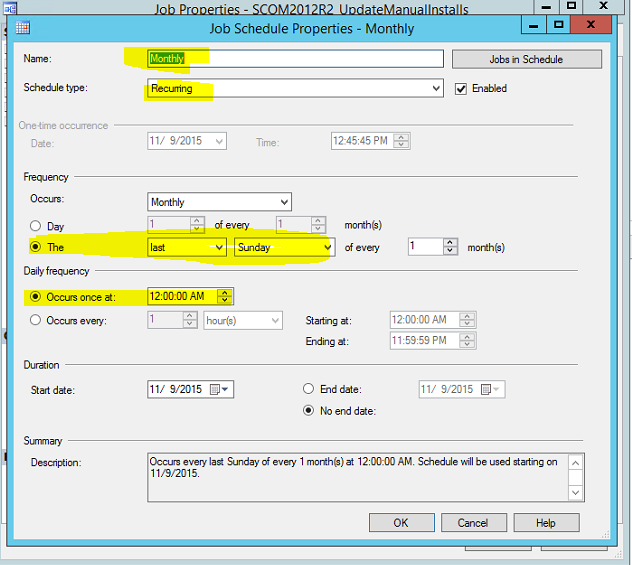 In my solution below, I was working with SQL Server 2012SP1. This should work for previous iterations of SQL Server as well, 2012, 2008R2, etc. 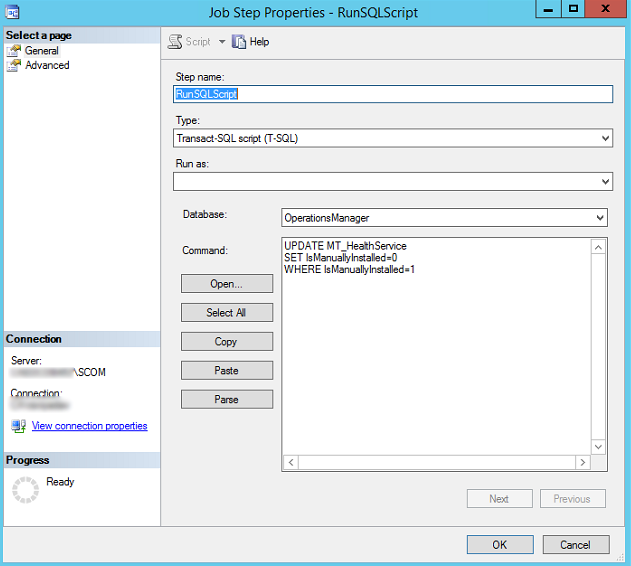 Following the steps below, and using the SQL query used in a previous POST, you can automate this as well! SCOM Servers not “Remotely Manageable”? Odds are you probably will have some machines where you can’t deploy the SCOM agent via SCOM console, or PowerShell, or some automated way, and you must install and configure the agent manually. Days/weeks/years go by and now you need to decommission that troublesome, manually installed agents Primary Managed Server. You go to the console and right click, and notice you cannot change the machines primary management server. Well that is because any manually installed agents SCOM/SQL disables this feature. Well, there is a workaround! Now that you have determined which servers were manually installed, to re-enable the remotely manageable feature, run the following SQL query (against the OpsMgr DB). You should note, this will re-enable this feature for all servers. Now you should be able to change your machine or any manually installed machines primary management server!